News Corp. CEO Rupert Murdoch in February 2011, when The Daily was launched. Now, it's in shutdown mode. Saying that "we could not find a large enough audience quickly enough to convince us the business model was sustainable in the long-term," News Corp. CEO Rupert Murdoch said this morning that The Daily will "cease standalone publication" on Dec. 15. Launched less than two years ago, The Daily was designed to be "a newspaper for the iPad era," as All Things D says. When he showed off the site in early 2011, Murdoch said that "new times demand new journalism." 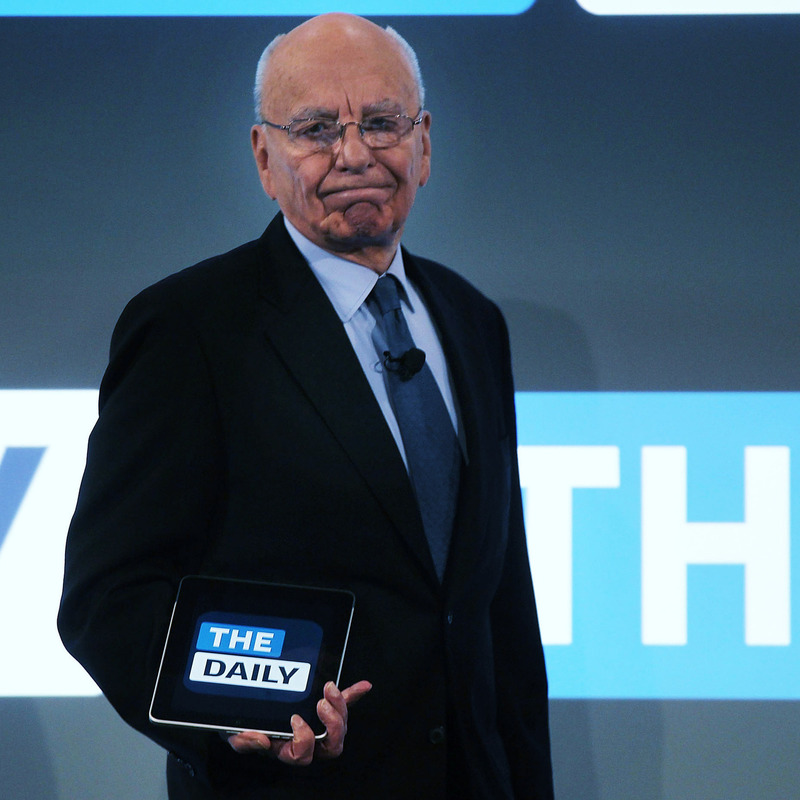 In a statement, Murdoch said The Daily will "will live on in other channels. Technology and other assets from The Daily, including some staff, will be folded into The [New York] Post." According to NPR's David Folkenflik, the news about The Daily was part of a series of announcements concerning News Corp.'s upcoming split. One part of the company, David tells our Newscast Desk, "will include newspapers, a book publisher, and various Australian TV holdings — it will retain the historic name News Corp. The other, larger entertainment and TV conglomerate — with such properties as the Fox movie studio and Fox News — will be called Fox Group." "The Wall Street Journal's top editor, Robert Thomson, will head the new News Corp. He will be replaced at the Journal by his deputy, Gerard Baker. "The Daily's top editor, Jesse Angelo, will become publisher of the tabloid New York Post. James Murdoch, [Rupert's son], will remain deputy chief operating officer of the new Fox Group — away from the papers which triggered the hacking and bribery scandal in the U.K."
Jill Abramson, executive editor of The New York Times, told her staff this morning that "she was seeking 30 managers who are not union members to accept buyout packages," the Times' Media Decoder blog reports. According to the blog, "the hiring The Times has done in recent years to help make it more competitive online has restored the newsroom to the same size it was in 2003 — about 1,150 people." But an "increasingly troubled advertising environment" has led to the need for trimming.